A mainstream English-language daily newspaper, Hindustan Times is widely read and respected by persons from all walks of life. Widely circulated, it has proven to be a popular choice amongst advertisers. When everything else has proven to be outright expensive, publishing an ad in Hindustan Times comes at a reasonable price. Advertisers can opt for classified text and classified display ads, and according to the requirement, can place the same under a variety of categories including education, business, matrimony, etc. 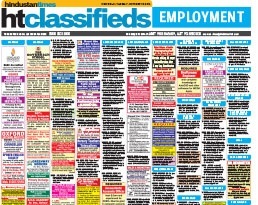 A Hindustan Times classified advertisement can also be booked online. We provide exclusive and nominal packages that encourage more advertisers to book classified ads with Hindustan Times through us.